Opera Software released Opera 58.0, a new stable version of the desktop web browser, to the public on January 23, 2019. Existing Opera users can use the built-in update functionality to download and install the new version; downloads are provided on Opera's website as well for those who prefer to download the installer. Opera users who want to use the updating functionality may either load opera://update in the browser's address bar and activate the "check for update" button on the page, or select opera://about instead to run an update check. Tip: Opera started to block extensions from interacting with search pages by default. You can fix that. Opera 58.0 is the first stable release of the web browser in 2019. It is a minor release judging from the list of features that Opera highlights in the announcement on the official Opera Blog. 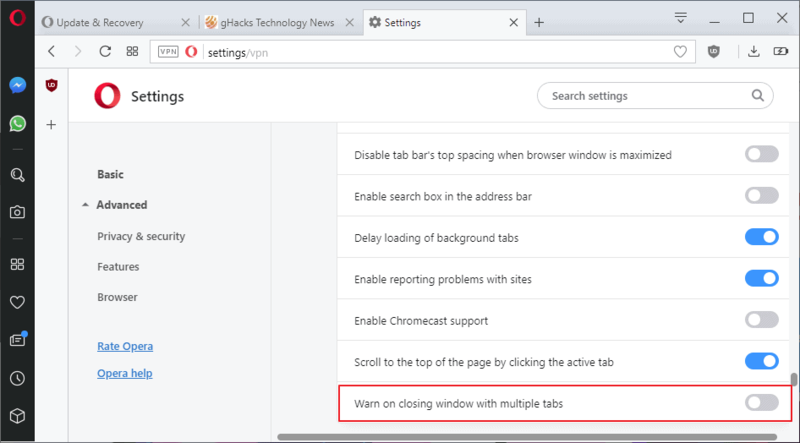 The core new feature of Opera 58.0 is a new warning dialog when browser windows with multiple tabs are closed. Load opera://settings/vpn in the browser's address bar. Scroll down to the User Interface section on the page. Locate "Warn on closing window with multiple tabs" and toggle it to off. The second feature that Opera Software highlights is the continued roll out of a new news delivery feature in Russia. The company integrated Yandex Zen as a news source which provides Russian users with personalized news. Option to remove entries from the auto-complete menu with the mouse has been removed (no x-icon anymore). You can still use Ctrl-Shift-Delete to remove entries. Chromium updated to version 71.0.3578.80. Site Isolation disabled for Desktop Stable. Chromium toast notifier enabled in Opera. 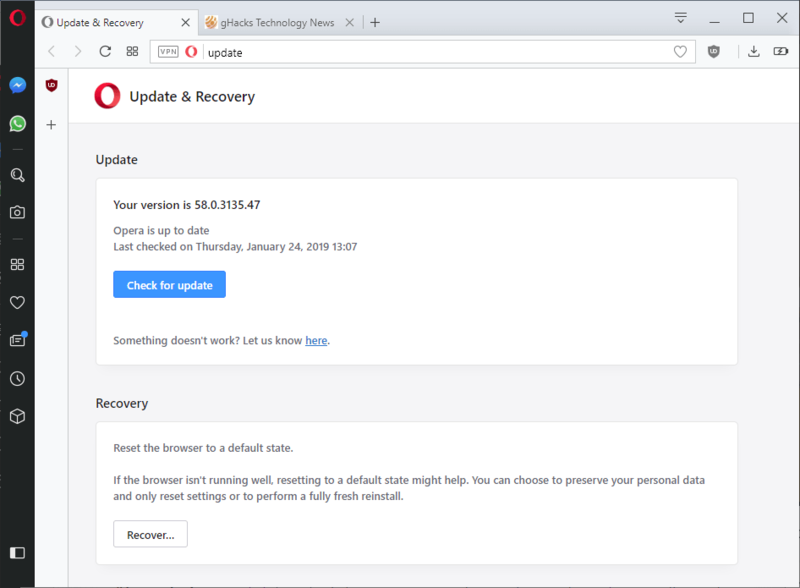 Opera 58.0 is a minor new release that does not add anything major to the table (apart from the upgrade to the new Chromium version). Now You: Have you tried Opera recently? This is why I really dislike the stupid chrome style version numbering. In the old days that would have been a point release at best and you’d know it wasn’t a major release. It just seems like a way to pretend to be doing more than you actually are. Sadly, Firefox has been going down this route for years also. It was a marketing genius who cooked this up at Google, I must say: churn out new Chrome versions in incessant Sprints, and make everyone believe you’re so much more modern and advanced than the rest. Chrome’s already at 71 while Firefox is only at 64; ergo, Chrome is better! @crambie: I could not agree more. I just updated to 58. Ctrl-Shift-T does not work for me either. I do like Opera and still use it but I use Firefox more often, it runs a bit quicker on my old Win 7 machine. Yeah, Opera is still a excellent browser on older and less powerful hardware. On newer hardware I have migrated to Vivaldi since they have finally figured how to make it perform in line with Opera and Chrome. I want my Opera 3.62 back. That’s really a Yandex.Browser thing, isn’t it?